In November 2004 the BBC broadcast a docudrama called "Space Odyssey: Voyage to the Planets" about a crewed mission around the Solar System. Unlike many space programmes this two-part series will stand the test of time due to the painstaking research that went into its production. The producer, Christopher Riley, was presented with an Arthur Clarke Award in 2005 for his work on the series. So, we were very pleased when he agreed to come and talk to us about the making of the programme. The basic premise of the UK series is that an international crew of five astronauts travel around our Solar System visiting a number of planets, moons, the dwarf planet Pluto and a comet. (In the US version they do not visit Pluto after the ship´s medical officer dies of radiation sickness). The astronauts´ home for their six-year mission is the spacecraft Pegasus, which is a long stick-like structure with a frisbee-shaped disc at one end that acts as a sunshield. The ship is 1.3km long and powered by a nuclear fusion reactor, and is similar to the Icarus II craft shown in the recent science fiction movie "Sunshine". To keep the astronauts safe from the high levels of radiation found in space, and especially near the giant planets, there is an artificial magnetic field generated around the habitation areas. In order to produce the stunning views in space, the team that worked on the BBC´s "Walking with Dinosaurs" were enlisted and their digital handiwork was blended with carefully crafted sets that were based on current technology. For example, the Pegasus command centre is a modified copy of the Space Shuttle and the laboratory is modelled on that of the International Space Station. 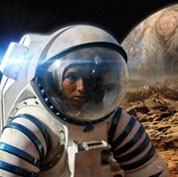 The realism is enhanced by the use of authentic props and images as well as having the actors perform some of their scenes in micro- gravity. Along with some of the sets, the actors spent a week in Star City in Russia where cosmonauts receive their training. They practiced spacewalks in a huge swimming pool known as a `neutral buoyancy tank´ where they floated around a full-scale space station mock-up. Then they had to endure trips on the largest covered centrifuge in the world where they were subject to high levels of acceleration that would mimic the high-G levels at a launch. To top it all, they had to act out zero-G scenes by taking a rollercoaster ride aboard a specially adapted Russian cargo plane; an Ilyushin 76 used to train cosmonauts. Chris Riley´s latest offering "In the Shadow of the Moon" has won numerous awards including the Sundance World Cinema Award at this year´s Sundance Festival. This 96-minute documentary tells the story of the men who flew to the Moon in their own words. It includes intimate interviews will all the surviving moonwalkers as well as re- mastered high-definition archive footage; some of which has never been seen before. There is no need for narration as the astronauts relate their profound story with thought-provoking phrases such as: "The moon doesn't change you. It reveals you" (Apollo 15 commander, Dave Scott). The film opens in UK cinemas in October 2007.